BRITISH POLICE ARE treating a multiple stabbing at a Manchester railway station on New Year’s Eve as a “terrorist-related incident”. The British counter-terrorism unit had been investigating the incident; this afternoon Chief Constable Ian Hopkins confirmed that the police had launched a terrorist investigation into the incident. He also asked anyone with footage in or around Victoria Station to submit it to the police to aid their investigation. 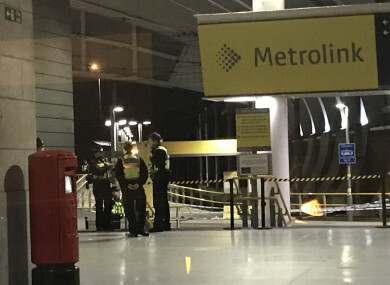 A man and a woman, both in their 50s, and a police officer have been treated for knife injuries following the stabbings yesterday evening at Manchester Victoria station in the northwestern English city. Witness Sam Clack, aged 38, a BBC radio producer, said he heard the suspect shouting “Allah” before and during the attack. The male suspect has been arrested on suspicion of attempted murder, Greater Manchester Police (GMP) said in a statement. Their injuries were described as serious but not life-threatening. The two members of the public were taken to hospital. The incident happened at around 8.50pm, when many revellers in the city would have been enjoying New Year’s Eve celebrations. British Prime Minister Theresa May thanked the emergency services for their work. Clack said: “I just heard this most blood-curdling scream and looked down the platform. He came towards me. I looked down and saw he had a kitchen knife with a black handle with a good 12-inch blade. Clack said police officers used a stun gun and pepper spray before, “six or seven” officers jumped on the man. Clack said he heard the alleged knifeman shouting “Allah” during the attack. A witness who gave her name as Rebekka told the Daily Mirror newspaper: “I heard the most blood-curdling scream I’ve ever heard and turned to see everyone running towards me. “I jumped off the tram track and started to run down the tram lines and hid behind some concrete slabs under one of the arches. I was just really scared, I didn’t know if I was going to die. Police declared the attack a “critical incident”. GMP Assistant Chief Constable Rob Potts said the investigation was being led by counter-terrorism police and officers were keeping an “open mind”. “Tonight’s events will have understandably worried people but I need to stress that the incident is not ongoing, a man is in custody and there is currently no intelligence to suggest that there is any wider threat at this time,” he said. “While we don’t yet know the full circumstances and are keeping an open mind, officers from Counter Terror Policing North West are leading the investigation. Email “Manchester police launch terrorist investigation into multiple stabbing at railway station”. Feedback on “Manchester police launch terrorist investigation into multiple stabbing at railway station”.